Amidst its ongoing aid efforts for the quake-victims in Sichuan, Mercy Relief (MR) joined hands with tech-social company AGplus Technologies Pte Ltd to roll out a series of appropriate water innovations at the Singaporean humanitarian NGO’s Toa Payoh office today. Using nanosilver technology, the new water solutions – PurHeart Bottle, PurHeart Straw and PurHeart Family – were jointly designed, developed and tested together with the Singapore Polytechnic (SP), to support communities affected by disasters and poverty, both at individual and household levels. AGplus’ Chief Technical Officer, Dr Liu Hongjun, had invented the world’s first chemically-bonded nanosilver ceramic technology in 2012. This latest water solutions will complement MR’s other water innovation which has been designed and deployed to serve at community level. Sealing the partnership, a Memorandum of Cooperation (‘MoC’) was inked between MR’s Chief Executive Hassan Ahmad, and Mr Harold Fock, Chief Executive Officer of AGplus. The Signing was witnessed by MR’s Advisor Abdullah Tarmugi, accompanied by AGplus Chairman Dr Tan Choon Hong, MR Board of Director Dr Kevin Chan, SP’s Senior Director Lim Cher Yam and Director of School of Architecture and the Built Environment Daniel Tan. The Singapore-born NGO received a surprise boost from a Singapore company, Cuffz Holdings Pte Ltd, which donated 2,000 units of the PurHeart Bottle (USD20 each) and 500 units of the PurHeart Family (USD25 each) for MR’s emergency stockpiling which forms part of its disaster preparedness programme. Under its Strategic Innovations and Partnership (STRIP) Unit set up in 2010, MR has been working closely with SP to design and develop appropriate technologies to support emergency relief efforts and sustainable development projects at crises-stricken and rural areas, focusing on water and sanitation, food, shelter and clean energy. 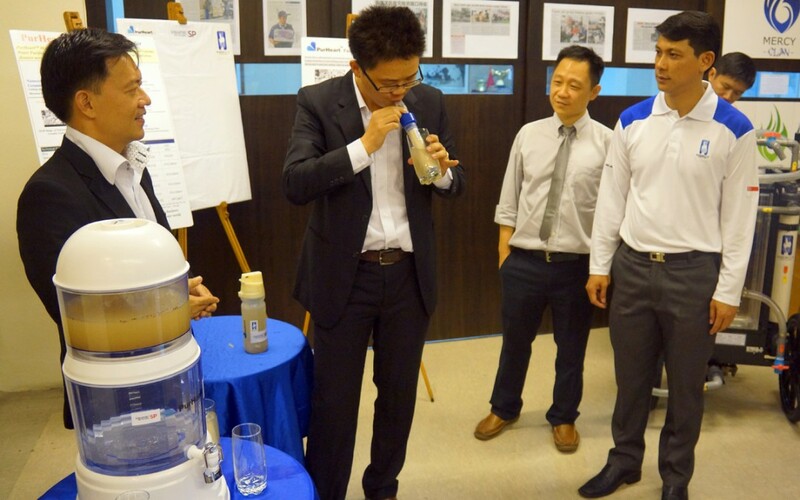 (left) AGplus’ Chief Technical Officer, Dr Liu Hongjun demonstrating on the functions and mechanics of the PurHeart Straw which comprises a cartridge of chemically-bonded nanosilver ceramic filter, with a filtration fineness of 0.2 microns, ensuring clean and safe drinking water. (right) MR Chief Executive Hassan Ahmad and AGplus CEO Harold Fock showcasing the clarity of the filtered water from the PurHeart Bottle, on a white canvas. (left) MR and AGplus toasting to a commitment on improving the well-being of the vulnerable communities through the provision of appropriate water technological solutions. (right) MR Advisor Abdullah Tarmugi sharing an insightful discussion with AGplus Chairman Dr Tan Choon-Hong on the world’s first chemically-bonded nanosilver ceramic technology. MR Chief Executive Hassan Ahmad and AGplus CEO Harold Fock inking the Memorandum of Cooperation (MoC) toestablish cooperation that would contribute to the development of appropriate technological solutions, in supporting sustainable development and emergency relief efforts at rural and crisis-stricken areas. Witnessing the exchange were AGplus Chief Technical Officer Dr Liu Hongjun (front left), MR Head of Corporate Outreach & Resource Tsai Pi Kuang (front right); (Back, from left) AGplus Chairman Dr Tan Choon Hong, MR’s Advisor Abdullah Tarmugi, accompanied by SP’s Senior Director Lim Cher Yam, MR Board of Director Dr Kevin Chan, and Director of School of Architecture and the Built Environment Daniel Tan.